Scroll down the page to see the latest news from around the region. On Valentine’s Day, 2019 the southeast Michigan Alhambra Caravans treated over 4000 of GOD’s Special people to a fun filled day at the 2019 Circus. The Suburban Showplace in Novi, Michigan has added an inside arena that was able to include high wire acts due to a high ceiling. An Oasis was included for volunteers after the show on the balcony above the arena also catered by DeCarlo’s. As in the past, 24 Alhambrans and their friends started the day at DeCarlo’s Banquet Hall where over 4000 hot dogs were cooked, and placed in special bags to keep them warm for transit to the Suburban Showplace. At the venue, other Alhambrans and their guests distributed these hot dogs along with Animal crackers and water bottles that were staged on Wednesday, the day before the Circus. The new arena provided a much improved parking and entry into the facility that now includes a full 3-Rings for the different acts. 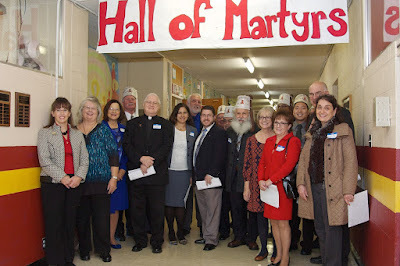 At the invitation of Supreme Chaplain Fr. 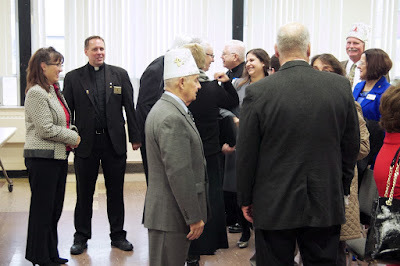 Paul Ballien, a mini Ceremonial was held November 19 at St. Linus in Dearborn. Supreme Director Cliffton Dake and members from around the region welcomed a total of 10 new Sir Nobles and Lady Nobles into the Order. We wish them many fulfilling years as part of our Catholic club assisting the intellectually and developmentally disabled. Thank you to everyone who came out to help. On September 20, 2015, Manresa Caravan provided a 3-hour cruise on the Clinton River for 61 of GOD’s special people. The weather was perfect for the cruise and all participants had a great time and thoroughly enjoyed the cruise as well as the lunch of burgers, dogs, goldfish crackers, chips and various soft drinks.